This thesis is dedicated to the study of information structure (IS). One must distinguish between the IS represented in the discourse mental model and IS as encoded in the grammar, which indirectly reflects the former (as the tense system of the language indirectly reflects our mental representation of time). This dissertation addresses the nature of the interface between the two: what information from the discourse IS system gets encoded in the grammatical IS system and by what means, and what information is lost? To answer it, IS­related word order variation and prosodic phenomena are analyzed (with data primarily from Russian). This thesis shows that IS notions in the grammar are relational (such as ‘more or less accessible’: A is more accessible than B) rather than categorical (such as ‘given’ or ‘new’: A is given, B is new). A model capable of encoding and interpreting such notions is developed. Crucially, relational notions cannot be encoded by means of IS features as used in the literature so far, which constitutes an important argument for configurational and against feature­based IS models. The resulting model relies on syntactic configurations, and prosodic IS phenomena are deduced from them. This sets it apart from other configurational IS theories. Finally, a novel account of the relation between the subject and the Tense domain (the role of the EPP­feature) is proposed for Russian. 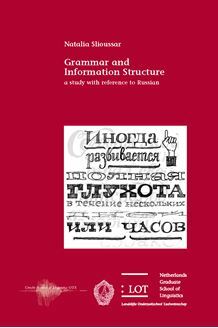 This dissertation is of relevance to scholars in the field of information structure, as well as to linguists working on the syntax­discourse and syntax­prosody interfaces and on the EPP.